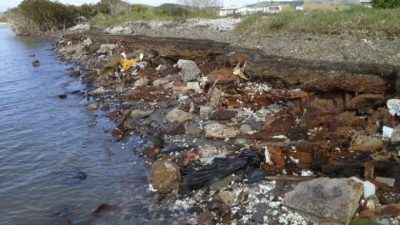 Coastal erosion eating away at an old tip at Kaiaua has required a $200,000 solution to stop rubbish being washed into the sea. Hauraki District Council said contractors would dig out the rubbish and truck it to a landfill in Auckland, licensed to take asbestos. The restoration was expected to eight days with barriers required to stop seawater entering the work area. Tests recently found no contamination around the landfill. 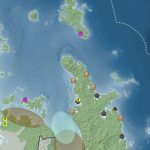 The council will also clean up waste already clinging to mangroves and littering the coastline and said it had received strong support from the community and iwi for the clean-up. A long-term plan for future management of the Bay of Plenty, Hauraki Gulf and eastern Northland snapper fishery was accepted by Primary Industries Minister Nathan Guy this month. Created by the SNA1 Strategy Group, made up of members from the customary, recreational and commercial fishing sectors, the plan focusses on improving fishing practices, minimising waste and gathering accurate information. For the first time in a century, the Duvaucel’s gecko can now be found in mainland New Zealand thanks to a successful reintroduction of the species into Tāwharanui Open Sanctuary. 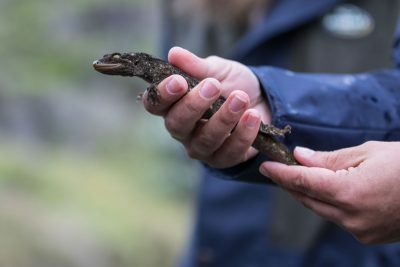 Auckland Council’s Regional Park Rangers and Biodiversity team worked with Massey University, volunteers from Tāwharanui Open Sanctuary Society Inc. (TOSSI), Ngāti Manuhiri and other iwi to release the geckos into the sanctuary. Tāwharanui Open Sanctuary is predator free apart from mice. Scientists will study the effect of mice on the native gecko population over time. This will also indicate the impact mice could have if they are introduced to offshore islands. DOC, Motuihe Trust and Yamaha are trailing weed control with an unmanned helicopter. 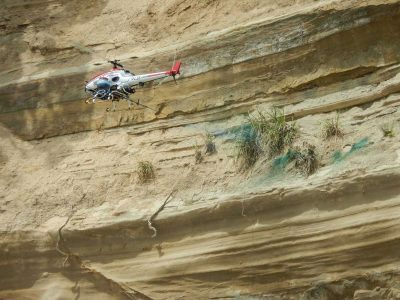 Weed control on cliff faces can be very expensive often requiring carrying heavy loads to remote places and abseiling or a helicopter. The RMAX helicopters are piloted by remote control and used in a wide range of industrial and research applications overseas. The trial was a success and the team have plans to further improve the precision of the technology. 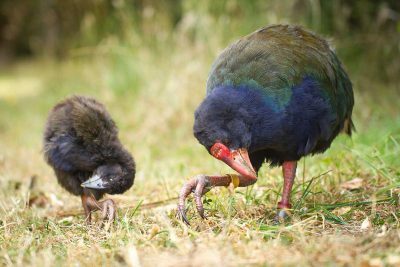 Hauraki Gulf islands have helped takahē numbers to reach 300 for the first time in more than 50 years. Takahē live in 19 different sites around New Zealand, with populations on Tiritiri Matangi, Motutapu and Rotoroa islands. The bird was ‘rediscovered’ in 1948 in Fiordland’s Murchison Mountains and has been the subject of a marathon conservation effort since. Panuku Development Auckland hosted a meeting of global waterfront development leaders in November. Water Edge 2016 brought together experts from 14 international cities in Europe, the US and Canada, Asia, and the South Pacific. Panuku Place Shaping Director Rod Marler said such symposiums create valuable relationships and an increased awareness of the complexity involved in creating outstanding urban waterfronts. On behalf of Auckland Council, Panuku owns over $550 million worth of assets on the Waitematā Harbour comprising public spaces, marina assets and commercial property. By 2022, it expects to have completed the delivery of $440 million worth of public sector infrastructure investment to leverage what will amount to over NZ$1 billion of private sector investment. A voluntary protocol which asks ships to slow down to avoid whale strike appears to be working. There have been no recorded deaths of Bryde’s whales in the Hauraki Gulf in the last two years. 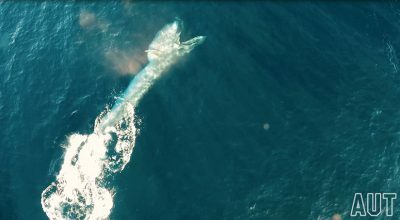 Previously, an average of two whales a year died from being hit by ships transiting the gulf, but the last whale death from ship strike was reported in September 2014. The voluntary initiative was brought in three years ago by the Ports of Auckland and the shipping industry. “The mortality rate of this small population of whales was probably unsustainable prior to the shipping industry’s commitment to slow down, but now these whales have a more certain future,” said University of Auckland’s Dr Rochelle Constantine. Average ship speed has dropped from 14.2 knots to around 10.5 knots. Foundation North has signed a memorandum of understanding with Auckland Council and the Department of Conservation. The agencies will provide advice, technical expertise and support for the foundation’s Gulf Innovation Fund Together (GIFT) project. GIFT is a $5 million innovation fund launched in August 2016 that aims to support the development of innovative solutions to complex environmental challenges facing the Hauraki Gulf. NIWA scientists are asking for help from people who have had a long association with the Hauraki Gulf. They are researching the areas where juvenile fish have congregated to find out how these nursery environments have changed over the years. 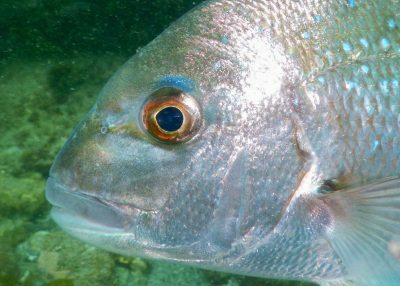 NIWA marine ecologist Dr Mark Morrison says they are particularly interested in populations of juvenile snapper, less than 10cm long in coastal waters. He says young fish are strongly associated with what’s on the seafloor, especially seagrass meadows, horse mussel beds and sponge gardens. Historical photographs, personal field diaries or fishing logs would be particularly valuable to document environmental change. A computer model will be built to enable the researchers to explore ‘what if’ scenarios to help decide on the best management actions for the future. 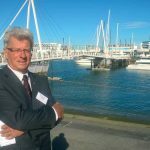 The Ministry for the Environment and Statistics New Zealand released the first individual “domain” report – on the marine environment – created under the Environmental Reporting Act 2015 in November. 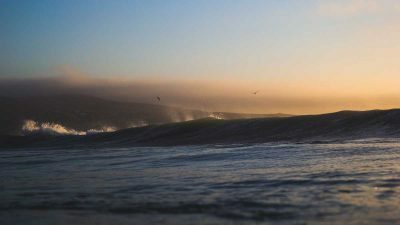 The report identifies key issues facing our oceans, ocean acidification, threats to native birds and marine mammals and the state of coastal habitats. 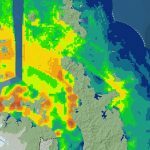 Environment Minister Dr Nick Smith said environmental reports are fundamental to understanding and addressing environmental challenges – an area where data has been lacking. Great Barrier Island has a new Department of Conservation base at Okiwi, rebuilt and redeveloped following damage in the June 2014 cyclone. Following the storm DOC has invested more than $2.5 million repairing tracks and facilities on the island. 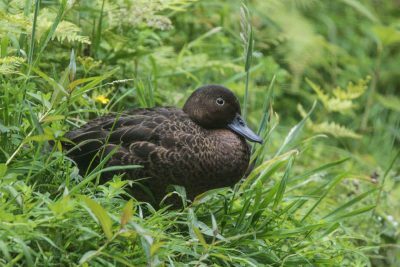 Meanwhile, community trusts on Kotuku Peninsula, which includes Glenfern Sanctuary, and at Windy Hill Rosalie Bay have received funding of $108,000 to advance conservation work. Rare species such as the black and Cooks petrels, pateke and chevron skink cannot survive without intensive pest control. 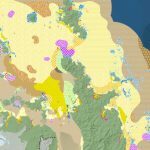 New Zealand has a new action plan setting targets for protection of our unique native animals and environment. 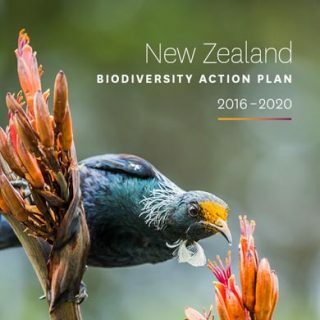 Conservation Minister Maggie Barry says New Zealand’s Biodiversity Action Plan 2016-2020 sets out how to turn the tide of biodiversity loss and counter threats to native species. The updated Action Plan includes Predator Free 2050, the Government’s commitment to ridding the country of rats, stoats and possums. It also includes targets to rid 500,000 hectares of wilding conifer infestation and expansion of the Healthy Nature, Healthy People programme. 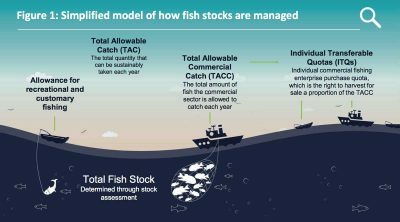 The Ministry for Primary Industries released a consultation document ‘The Future of Our Fishing’ as part of its ongoing review of the fisheries management system in November. It covers a wide range of issues including discarding, shared fisheries, certification, information gathering, ecosystem based management, commissioning of research and delegation of decision making. 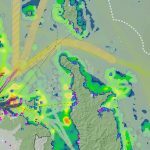 The document includes specific options for the implementation of an integrated electronic monitoring and reporting system on fishing vessels and for changing regulations to enable new trawl technology. 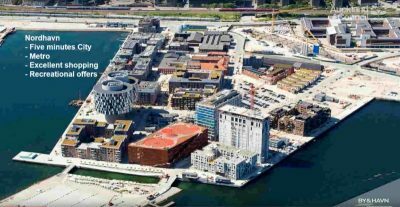 MPI also announced the formation of a new Technical Advisory Group to give expert, independent advice on the proposals, to be chaired by Sir Rob Fenwick. The Million Metres Streams Project is offering a Christmas present that cleans rivers and lakes. 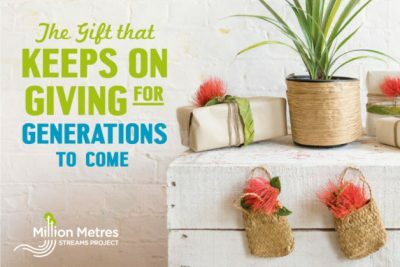 A $20 donation will plant one metre of stream bank with four native trees. An ‘e-gift card’ can be passed on to the person you are buying for. The project aims to restore native bush to a million metres of New Zealand’s waterways. This year’s Partners Life DUAL triathlon, marathon, mountain bike, 10km run and walk events on Motutapu and Rangitoto will be held on Saturday 25th March 2017. Proceeds from registrations support the work of the Motutapu Restoration Trust and entry numbers are limited to protect the environment.